Located only 8kms from the Von Lindequist Gate on the eastern outskirts of the Etosha National Park, Mushara Lodge is ideally situated for travelers visiting the park. Mushara Lodge consists of ten spacious chalets, one family unit and two single rooms. The name Mushara derives from the Purple Pod Terminalia tree, which grows in abundance in the lodge grounds and the surrounding area. The thatched public area consists of a small library with a selection of good books, a bar with an extensive wine cellar, airy lounge with welcoming fireplace for winter evenings, a dining area and well stocked curio shop. Great attention has been paid to the décor, which is an electic blend of traditional African and modern art works combined with original paintings. In a horseshoe shape around the swimming pool there are ten well-spaced thatched chalets. Each chalet and the rooms are extremely spacious and are furnished with air-conditioning, mosquito net, mini bar fridge, safe, tea and coffee making facilities, electric lights, direct dial telephone, wardrobe and luggage rack. The bathrooms are en suite with separate toilette. Seven of the chalets have just a shower and the other three chalets, the triple room and the single rooms have a bath and shower. 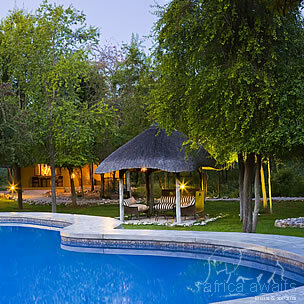 A feature of Mushara is its large, tiled, bright blue swimming pool surrounded by green lawn that is kept well manicured by the occasional visiting local wildlife. Etosha National Park is one of Southern Africa’s finest and most important Game Reserves, which was declared a National Park in 1907. The park covers an area of 22 270 km² and is home to 114 mammal species, 340 bird species, 110 reptile species, 16 amphibian species and one species of fish. A San legend, depicting the formation of the Etosha Pan tells of how a village was raised and everyone but the women slaughtered. One woman was so distraught about the death of her family she cried until her tears formed a massive lake. When the lake dried up nothing was left apart from a huge white pan. 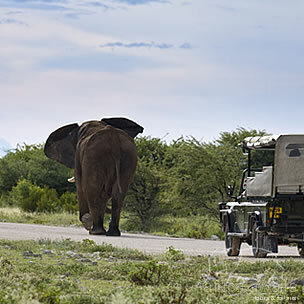 On our game drives guests experience a fascinating perspective of wildlife in Etosha. Our vehicles have an all weather safety design for the wet and dry season- they offer a 360 degree open-air unobstructed view - optimal height for visibility in spacious and comfortable atmosphere - up-to-date game movement information and thereby a high success rate in game spotting. 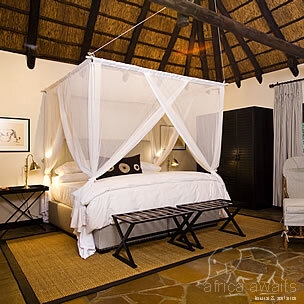 With your holiday, safari or business trip from in to Mushara Lodge in Namibia.